Amar Asom (Assamese: আমাৰ অসম) is an Assamese daily newspaper published by the G. L. Publications Ltd. Established in April 1995, and the headquarters is based in Guwahati. 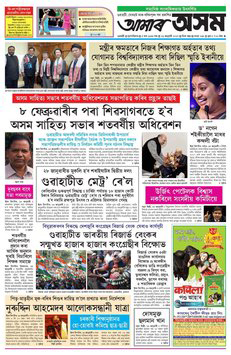 It is a highly respected newspaper and Amar Asom epaper is also popular across Assam. Prasanta Rajguru is the Editor of Amar Asom, and is simultaneously published from three places --- Guwahati, Jorhat and North Lakhimpur. In addition to the Amar Asom, the group publishes Purvanchal Prahari in Hindi and two English dailies.